how my laundry looks like this. And I’m not the one who did it. I go out to lunch with friends and when I get back, my laundry looks like that. And the floors are clean and mopped. And the kitchen is sparkly. And so are the bathrooms. And did I mention… I didn’t do it. ‘Ayi’ in Chinese (pronounced I-E) refers to a housemaid or nanny. 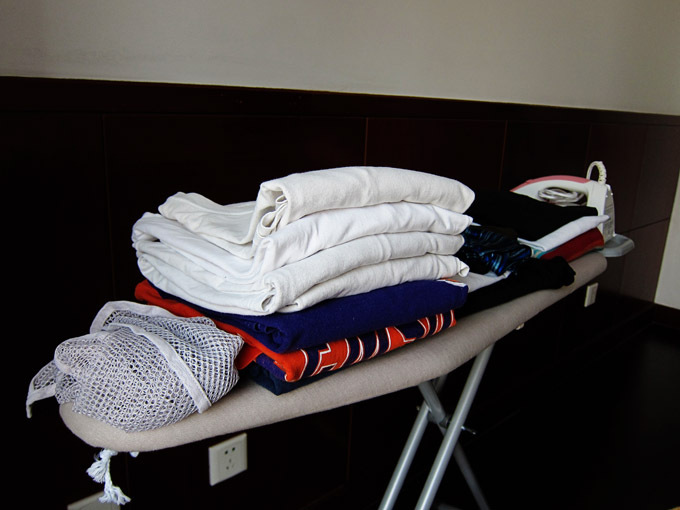 Many expats, and some Chinese, hire an ayi to help around the house. Labor is so inexpensive here (I’m sure you’ve heard) that it costs less for us to have a maid weekly than to go out to dinner once. When we first arrived, I had heard about the ayis in China. I wasn’t really planning on hiring one. I mean, really, I’m on funemployment. I think I can spare the time in my busy schedule to straighten up around the house and do some laundry. But when another of the expats mentioned her ayi was looking for more work, I listened. And I had just spent the last 3 weeks hanging our clothes to dry. (We don’t have a dryer here… they are VERY expensive and hold like 3 pair of socks.) And ironing. I HATE ironing. Of all the household chores, it’s the one I hate the most. I’m just no good at it. By the time I’ve spent 15 minutes trying to iron the one shirt, it has more wrinkles than it started with. We didn’t even OWN an iron back in the States. Really. If it needs ironing… toss it in the dryer. Or don’t wear it. You can’t get away with that when you’re hang drying your clothes. …and did I mention I hate ironing? I will gladly pay $15 per week to get out of ironing. This entry was posted in Expat Advice and tagged China blog, Housing, Life in China by Country Fried Egg Roll. Bookmark the permalink. Love your perception of China…have truly enjoyed it. I want an AYI!!!!! I’ve got a mexican but he only works in the chicken house and I have to pay him a lot more than $15/week. 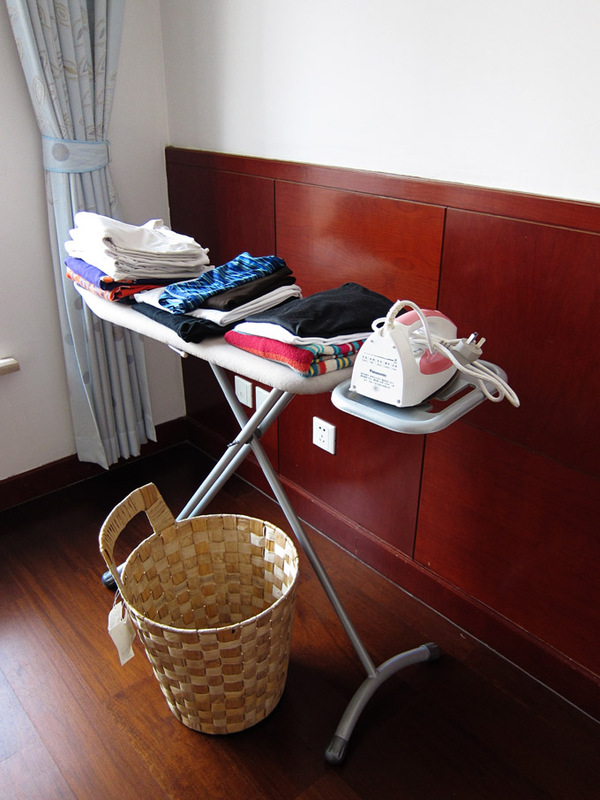 I live in Shenyang too and a dryer didn’t cost us anymore here than it would in the states for a nice one. It’s WONDEFUL!! and all we have to do is switch cords when we get home and it will work there too. I can’t handle it taking days for sheets to dry and I HATE crunchy jeans and sheets. Also the dryer is normal size, not tiny at all. In fact, my washer is smaller and the dishwaster we had was so small our plates didn’t fit! It was well worth getting the dryer. Now I can do my own laundry, no ironing needed. I can save from paying the Ayi and use that for my spending money on upcoming trips and as far as washing the floors and cleaning the bathroom, it’s exercise when it’s too cold to walk in the park. I do have 2 kids and I clean when my little one naps. Besides, the building we love in, you can’t get an Ayi for less than 300RMB a week, that’s almost $2400 a year. Besides, we won’t have a maid when we go home so why get use to having one here ’cause you know after being here for 7 years you would really get use to it! Is your ayi looking for any more work? I was thinking of getting one too but not full time. Could you let me know? Thanks for the comment… I think so but I’ll ask her. She is awesome! Ayi is looking to pick up some more part time work now if anyone is looking. She prefers the Riverside/ Wobo/ New World area. hi, would u know where i can find an ayi in shenyang to look after my child during weekdays while i am at work? i need one by th end of the october holiday. any advise will be highly appreciated. Where do you live? Often, a good way is to ask at the office of your apartment complex. They should be able to put you in touch with some who work in your building. You could also post on the Shenyang forums at http://www.expatacular.com/.